Two hundred works by Nek Chand are currently being shown at the John Michael Kohler Arts Center, Sheboygan, Wisconsin, USA. The exhibition, The World in a Garden: Nek Chand, is part of the Arts Center’s 50th anniversary program, a yearlong exploration of art environments called The Road Less Traveled, and the Nek Chand works will be on view until June 4th. The statues, which are from the Arts Center permanent collection, are displayed with Rock Garden site photos and drawn surveys by Professor Iain Jackson, of the Liverpool School of Architecture, UK, and author of The Collection, The Ruin and The Theatre: Architecture, Sculpture and Landscape in Nek Chand's Rock Garden, Chandigarh (2007). The World in a Garden exhibition features works placed on stepped platforms and arches, evoking the architecture of the Rock Garden environment. 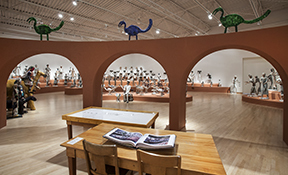 The sculptures in the JMK Arts Center permanent collection were personally selected and donated by Nek Chand over a period of eight years and include a wide variety of human, animal and mythical figures. Chandigarh Live: "Creator of rock garden prepares to celebrate"
Reuters: "12 Acres of Garbage Bits Are an Artistic Attraction in India"
New York Times - "Correspondent's Choice"